Central venous catheters are commonly used in clinical practice. Right atrial thrombosis is a relatively common complication associated with indwelling catheter use. Thrombosis can be in different locations and forms within vascular and intracardiac structures. Echocardiographic images may mimic some anatomic and pathologic variants. 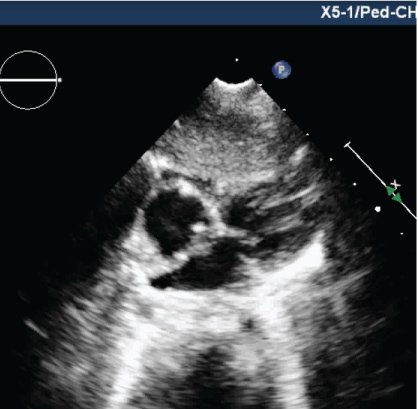 We describe a case of a two-months-old girl with a thrombus which cor triatriatum dexter-like appearance in the right atrium due to the central venous catheter. Hereditary or acquired risk factors have been clearly defined as the most common etiologies to date. Central venous catheters (CVCs) are commonly used in clinical practice. Thrombosis is a relatively common complication associated with CVC. The risk of developing thrombosis associated with host factors, catheter characteristics, cannulation area, and infused fluid . Thrombi within cardiac chambers are associated with an increased risk of mortality due to their potential for embolization. The treatment approaches were thrombolytics and/or anticoagulants or rarely surgical thrombectomy . Herein we present a thrombosed case with a cor triatriatum dexter-like appearance in the right atrium resulting from the central venous catheter. The familiy of the case signed an informed consent. A two-months-old girl suffering weakness, anorexia, vomiting and growth retardation presented to our hospital. She was diagnosed Bartter syndrome. In her history, it was learned that she was hospitalized for sepsis, pneumonia and was cannulated with the umbilical venous catheter. Seventh day of the birth, echocardiography performed due to murmur had no additional pathology other than foramen ovale. In her physical examination, the heart rate was 136/bpm, respiratory rate was 28/min, blood pressure was 85/52 mmHg, and peripheral oxygen saturation was 94% by pulse oximetry. The patient had no dyspnea. There was a 2/6 systolic murmur over mesocardiac area. Complete blood count revealed leucocyte: 14.000/mm3, hemoglobin: 11 g/dl, platelet: 280000/mm3. Hepatic and renal function tests, C reactive protein were in normal ranges and blood cultures were negative. Chest X-ray and electrocardiography were also normal. Echocardiographic (ECHO) examination revealed that foramen ovale was patent with left to right shunting. An echodense fibromuscular membran like a thrombosis with dimensions 23*5 mm and which not obstruct the blood flow, was observed in the right atrium cavity between the right atrium anterior wall and the coaptation area of the tricuspid valve leaflets (Figure 1A and Figure 1B). There was no known familial history of thromboembolic disease and examination for thrombophilia was normal. Factor V Leiden, MTHFRC677T, MTHFR A1298C and the prothrombin 20210 gene mutations were not detected, the prothrombotic work-up, including assessment of antithrombin III, protein C: 0.84 (0.65-1.54), protein S, antiphospholipid antibodies, homocystein, was within normal limits. Human cytomegalovirus infection, another possible cause of neonatal thrombosis was also excluded. We observed that the thrombosis was completely resolved after sixteen day of subcutan enoxaparin treatment with therapeutic dose (2 mg/kg per day, 2 doses) (Figure 2). After complete resolution of thrombosis, it was continued for 3 months with a prophylactic dose (one dose per day). The most common location for intracardiac thrombosis is right sided chambers of the heart . Right atrial thrombosis (RAT) is a relatively common complication associated with indwelling CVCs . Risk factor for RAT in children include the classic elements of Virchow's triad; stasis, hypercoagulable state, vascular injury. The presence of CVCs within the vena cava or right atrium causes disruption of blood flow, and intimal damage. The incidence of clinically apparent thrombosis was 0.7-2.4 per 1,000 admissions to neonatal intensive care unit and almost 90% of which were related to the use of a CVC in the several studies . Surgical resection, catheter embolectomy, and thrombolysis are the main treatment options. In pediatric patients with thrombosis, detailed patient management is seriously hampered by the lack of appropriate clinical trials [4,5]. Asymptomatic and hemodinamically stable patients, with RAT which was immobile, attached to the atrial wall, small to moderate sized (< 2 cm), nonpedunculated, and non snake-shaped, were associated with good prognosis. In these patients, Yang J, et al. recommend close monitoring by ECHO with or without anticoagulant therapy. In infants with no life-threatening condition and thrombosis in right sided cardiac chambers, LMW heparin could be preferred, such as in our case. In the literature, we did not find any thrombus like this case. This case shows that repeated ECHO in patients who are followed up with central catheter insertion is important for showing the thrombus which can occur. Thrombosis can be in different locations and forms within vascular and intracardiac structures. As in this case, echocardiographic images may mimic some anatomic and pathologic variants. In addition the thrombus must be differentiated from infective endocarditis or neoplasm in order to provide the correct treatment. Cetin Iİ, Ekici F, Ünal S, Kocabaş A, Sahin S, et al. (2014) Intracardiac thrombus in children: The fine equilibrium between the risk and the benefit. Pediatr Hematol Oncol 3: 481-487. Revel-Vilk S (2006) Central venous line-related thrombosis in children. Acta Haematol 115: 201-206. Revel-Vilk S, Ergaz Z (2011) Diagnosis and management of central-line-associated thrombosis in newborns and infants. Semin Fetal Neonatal Med 16: 340-344. Kayıran PG, Gurakan B, Kayıran SM (2013) Successful treatment of arterial thrombus in an extremely low-birth-weight preterm neonate. Pediatr Neonatol 54: 60-62. Alex V, Marcel FN, Ina MB (2008) Thrombosis in the critically ill neonate: Incidence, diagnosis, and management. 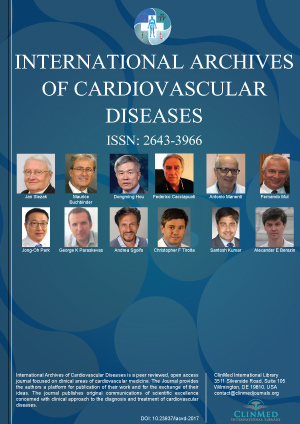 Vasc Health Risk Manag 4: 1337-1348. Yang JY, Williams S, Brandão LR, Chan AK (2010) Neonatal and childhood right atrial thrombosis: Recognition and a risk-stratified treatment approach. Blood Coagul Fibrinolysis 21: 301-307. Hazım Alper Gursu, Associate Professor, University of Health Sciences, Ankara Child health and Diseases Hematology, Oncology Training and Research Hospital, 06110, Ankara/Turkey, Tel: +90-505-561-87-99. © 2019 Surucu M, et al. This is an open-access article distributed under the terms of the Creative Commons Attribution License, which permits unrestricted use, distribution, and reproduction in any medium, provided the original author and source are credited.